The first issue of Union, the newspaper of Sir Oswald Mosley’s new post-war Union movement, appeared in February 1948 and featured articles by Guy Chesham and Yockey, who worked together in the European liaison section of the movement. Yockey wrote that the “old” must inexorably make way for the “new,” despite resistance, according to the organic laws of history. The past era was that of “democracy,” “materialism,” and plutocracy. No conservative reaction could prevent it. The new epoch would be one of the resurgence of authority, of which Fascism and National Socialism had been provisional forms. The military defeat of these provisional forms by the old forces of democracy and money would be no more enduring than the defeat of Napoleon by the forces of conservatism in the previous epoch. “History has its own logic,” and the old cannot forever hold back the new. Democracy was the Idea of the “Spirit of the Age” from the nineteenth century, but the Resurgence of Authority would be the Idea for the new Zeitgeist. 1848, the year of the democratic-bourgeois revolutions throughout Europe, and the year of The Communist Manifesto, was superseded by 1948, when Imperium appeared, and the European Liberation Front was born as the vanguard of the new Zeitgeist. At that moment, Yockey had hoped that Mosley and the Union Movement would fill that historical necessity, and thus concludes this piece with a eulogy to Mosley’s heroic struggle. Here we see a major theme of Yockey’s as-yet-unpublished Imperium manuscript. Like Karl Marx explaining the historical inevitability of Communism, Yockey drew on Hegel to show the historical inevitability of the Western Empire. As we know, there were “Right-wing” Hegelians and “Left-wing” Hegelians, Marx being among the most prominent of the latter. Yockey listed Hegel as one of the philosophers to develop an “organic” theory of history, along with Goethe, Spengler, Carlyle, Nietzsche, et al. “The Destiny-Idea is the central motive of organic thinking,” Yockey wrote in Imperium. To Marx’s “dialectical materialism” as a “scientific” analysis of history, Yockey countered with what the German Idealists called the Zeitgeist, or “spirit of the age.” To the Hegelian dialectic, Yockey added Spengler’s historical morphology and the “Heroic Vitalism” of Thomas Carlyle, to show that the historical dialectic is unfolded not by proletarian masses impelled by their stomachs, but by heroic individuals with a sense of destiny. The instrument of that destiny Yockey hoped would be Mosley and the Union Movement. Everyone is familiar with the events of 1848. It was the year of the victory of the Democracy Idea everywhere in Europe. That victory however, did not come suddenly in this decisive form. Nor was it the first success of the Idea of Democracy. The Napoleonic Wars were the expression of this same spirit, and the Vienna Congress of 1815 at the end of those wars was the absolute denial of this spirit, as well as the symbol of its complete defeat. But—History has its own logic, and only on the surface could Metternich and the Fürstenbund prevail. In the historical depths, the Idea of Democracy – the real ruler of men’s minds in that Age—continued to live and grow. It rose in 1830, and was repressed. Its positive force compelled all men’s souls. Opposition to it was a mere negative, for this Idea was the creative force of the Age.” It is not surprising that men resisted this Idea, for the New is always established only over the blind and sterile opposition of the Old. For two great reasons, the forces of the Old Idea fight the New Idea. First: the leading minds do not become the servants of the Old Order, for these minds are claimed by the New Idea, the Idea of the Future. Thus the Old Order simply does not understand the Spirit of the Age. Second: this Old Order has material interests in the perpetuation of the existing forms of organization, which by their existence work for its purposes. It is not surprising that men resisted this Idea, for the New is always established only over the blind and sterile opposition of the Old. For two great reasons, the forces of the Old Idea fight the New Idea. First: the leading minds do not become the servants of the Old Order, for these minds are claimed by the New Idea, the Idea of the Future. Thus the Old Order simply does not understand the Spirit of the Age. Second: this Old Order has material interests in the perpetuation of the existing forms of organization, which by their existence work for its purposes. Nevertheless—the Old Idea always goes down before the New Idea, and 1848 is a symbol of this invariable organic law. 1948 sees also the struggle between the Old and the New. In one respect, it resembles 1848—it is the struggle of the super-national Spirit of the Age against the forces of sterile Conservatism and Reaction. In every other respect it is the contrary of 1848, for the Spirit of our Age is no longer that of Democracy and Materialism, but that of the Resurgence of Authority in every sphere of Life. Regardless of what it meant in 1848, in our day Democracy means the rule of finance-capitalism through the technique of party-corruption. Just as no force within the Western Civilization could stand against the Democracy-Idea in 1848, so today, no inner Western force can oppose the further organic development of the West and the Resurgence of Authority. It is today a stark and gruesome fact that non-Western forces alone are frustrating the natural development of our Civilization, by starving and looting the peoples of the West. They base themselves in Communism and International Finance. These forces perpetuate the Balkanization of the West, and they direct their puppet governments in Europe. The victims of this gigantic process are not alone the Peoples of Europe, but all who fall beneath Communist or Financial rule. Is this to continue? Is a mighty Civilization to be strangled in this fashion? Is the Blood of the Western Civilization to be turned into Money? The Spirit of the Age says: NO! This Spirit claims the best men of the Western Civilization all over the world, and imbues them with the mission of the Resurgence of Authority, and the destruction of that finance-capitalism which today covers up its operations of Death and Chaos with the outworn catchword of Democracy. It bestows upon them the mystical force of its Destiny, a force which no mere material preponderance, and no mountains of lying propaganda, can overcome. 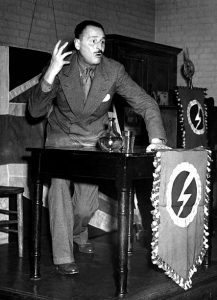 Against Money, we pit the Spirit of Heroism; against their compulsion-propaganda, our Discipline; against their cynicism, our Faith; against the reactionary rule of their unclean parties, our Leader on the path to the Future, Oswald Mosley. “G. C.,” “What Price Western Union?”, Union, No. 1, February 14, 1948. Yockey, Imperium (Sausalito, Ca. : Noontide Press, 1969), pp. 13-16. The Fürstenbund was an alliance of Protestant princes in the Holy Roman Empire established by Frederick the Great in 1785 in order to prevent the Catholic Habsburgs from gaining possession of Bavaria. It dissolved after the outbreak of the French Revolution and the death of the then Habsburg monarch, Joseph II. “F. P. Y.,” “1848–1948 Years of Decision,” Union, No. 1. Published: October 5, 2018 | This entry was posted in North American New Right and tagged articles, Communism, democracy, Francis Parker Yockey, Kerry Bolton, North American New Right, originals, Sir Oswald Mosley, The World in Flames, Union Movement. Both comments and trackbacks are currently closed. Mosley appeared with the “flash and circle” as late as 1949? Indeed impressive work. I’m wondering if there’s a good story behind the locating of these texts. There are indeed. There are reasons why the book has been delayed. I’m so glad that you’ve managed to find some of these “lost” essays by Yockey. Really outstanding work. Because if not for you, they would’ve been lost forever, surely.